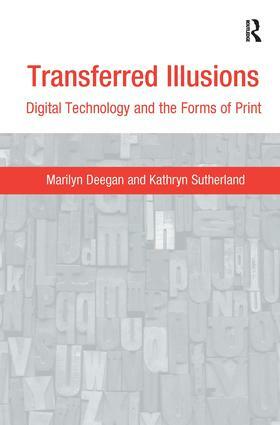 This is a study of the forms and institutions of print - newspapers, books, scholarly editions, publishing, libraries - as they relate to and are changed by emergent digital forms and institutions. In the early 1990s hypertext was briefly hailed as a liberating writing tool for non-linear creation. Fast forward no more than a decade, and we are reading old books from screens. It is, however, the newspaper, for around two hundred years print's most powerful mass vehicle, whose economy persuasively shapes its electronic remediation through huge digitization initiatives, dominated by a handful of centralizing service providers, funded and wrapped round by online advertising. The error is to assume a culture of total replacement. The Internet is just another information space, sharing characteristics that have always defined such spaces - wonderfully effective and unstable, loaded with valuable resources and misinformation; that is, both good and bad. This is why it is important that writers, critics, publishers and librarians - in modern parlance, the knowledge providers - be critically engaged in shaping and regulating cyberspace, and not merely the passive instruments or unreflecting users of the digital tools in our hands. Contents: Preface; After print? ; A future and a past for newsprint; The cultural work of editing; New modes of publishing; The universal library; Durable futures; Bibliography; Index. Marilyn Deegan is Director of Research Development, Centre for Computing in the Humanities at King's College London as well as the Co-Director of the AHRB ICT Methods Network. She is editor of the journal Literary and Linguistics Computing and has worked on numerous digitization projects in the arts and humanities. Kathryn Sutherland is Professor of Bibliography and Textual Criticism at St Anne's College, Oxford. She teaches and researches on bibliography, textual criticism, Romantic period writings, Scottish Enlightenment, textual theory and Jane Austen. Digital technologies are increasingly important to arts and humanities research, expanding the horizons of research methods in all aspects of data capture, investigation, analysis, modelling, presentation and dissemination. This series, one of the first and most highly regarded in the field, covers a wide range of disciplines and provides an authoritative reflection of the 'state of the art' in the application of computing and technology. The titles in this peer-reviewed series are critical reading not just for experts in digital humanities and technology issues, but for all scholars working in arts and humanities who need to understand the issues around digital research.